Well, here it is: I have decided to suspend my involvement with RPG Blog for now. With a family and career to consider, you only have so much time to spread around. Right now, I feel I need to devote as much of my hobby time as I can to Palladium's fledgling Megaversal Ambassador program. It is something I believe in, something I want to make strides in, and the best way I feel I can continue to introduce folks into this hobby. Now, it isn't as bad as all that: I'll still be doing reviews regularly at The RPG Site and RPGNet, and RPG Blog will likely return as soon as I figure out a format that is easier on my scarce free time. My email address will likely remain the same for now as well, so please, keep the mail coming--sooner or later, RPG Blog will return--different, but still excited about gaming as ever. Thanks to everyone for reading, and we'll see you around soon! Sorry for the absence--back soon! As I believe I've mentioned (repeatedly), HinterWelt is one of my favorite companies, so let me take this opportunity to pimp their Sky Is Falling sale. For the next week, save 50% on any file in their catalog. I would recommend checking out Roma Imperious, for one (or if you've already picked that up, try Nebulon or Supers Inc.
One of my favorite races in all of fantasy gaming has to be the gnomes. I prefer the incarnation that sees them as endless tinkerers, inventing often useless items for often invention's sake alone, keepers of strange technology, the ultimate examples of inspiration without application. If nothing else, gnomes make it very easy to introduce some unorthodox items and weaponry to your games. If your group is getting bored of standard longswords and shortbows but can't afford/obtain those rune weapons yet, perhaps its time to visit your friendly local gnomes, who promise "Technology Indistinguishable From Magic Or Your Money Back!" (note: refund offer not good in most realms). Idea: Don't have the room to carry a full lance, or are you a demi-human who just isn't tall enough to port one around when you aren't riding? The Switch-Lance makes porting about the lance a breeze during horseless adventure periods! Simply push a button on the handle, and watch the Switch-Lance expand! Pros: Easy to carry, as advertised. Push-button operation also allowed for surprise impalement of enemies. Cons: Had a tendency in gameplay, when the button was pressed, to fire out at a speed that would drag small demihumans along with it on a failed strength check. Also, a fumble roll indicated that the user accidentally fat-fingered the button, retracting his Switch-Lance in mid-melee, leaving him defenseless. Idea: Perhaps one of the cruelest tricks ever played on a stupid player, the Lightning Rod was purchased by a non-spell user who wished to have some magic power. He mentioned control of the elements, and the Gnomes, misunderstanding, provided him with a "Lightning Rod", a slim, long metallic wand that "one only had to hold above their head in a storm to witness results". And so the very, very gullible player did. Once. Pros: Assuming one can persuade an enemy to hold The Lightning Rod over his head in an empty field during a thunderstorm, a devastating weapon. Idea: Marketed by a gnomish alchemist who felt steam power could revolutionize the face of warfare, the Steam-Driven Crossbow was to be the ultimate weapon, sending heavy shafts shooting across the battlefield at insane rates of fire. With only one of the puppies (only 16700 gold for the prototype model), a single man could take the place of an entire company of regular crossbowman. Pros: Devastating range, incredible power, miraculous rate of fire. Cons: With the addition of the steam-driven parts, the crossbow weighed upwards of 420 pounds, the main part being a small boiler that had a tendency to vent steam on a fumble roll. Casualties: 0.5 (a near-death experience during a boiler explosion). And the less that's said the better about such items as the Personal Backpack Airship, the Black Powder Sword Launcher, the Black Powder Sword Launcher Mark II, the Automatic Portable Sword Repair Assembly, and the infamous Heat-Seeking Caltrop. Thanks to reader Tomas, otherwise I would have completely blanked this one. As featured on many sites such as this one as well as publications like Dragon, the Ultimate Game Table has until now existed as a near-masturbatory fantasy for "The GM/Gaming Group That Must Have Everything". According to agyris.net, the Ultimate Game Table will be going up for auction on e-bay within the next couple of weeks (target date: November 12th). Those of us without the disposable income to compete may simply console ourselves with the thought that such a thing is needlessly extravagant and totally unrelated to quality gaming, but inside, you know we weep. Some very cool reviews are in the pipelines, by the way--thanks to everyone for submitting such interesting products for review! I know we get backlogged sometimes, and I thank you for your patience. Bless Jeff's Gameblog. 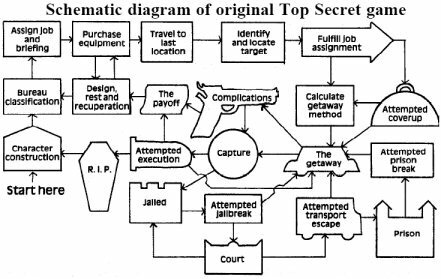 The best eclectic mix of gamer and geek entertainment out there (along with JimBobOz's Big List of Links) recently published this Top Secret flowchart from Dragon #40. If that doesn't make you want to run right out an run some old-school Spycraft, James Bond 007, Ninjas & Superspies, or Top Secret itself, I'd like to know what would. Oh, and Happy Halloween! Hope everyone has a fun and safe night tonight. And please don't smash my pumpkin this year. Now I'm fully aware online petitions usually manage little aside from letting folks vent, but this is one I thought I'd bring up (if for that reason alone). When DriveThruRPG and RPGNow announced their merger last week into OneBookShelf, one piece of baggage included with that was that there would be a publisher commission hike (upwards of 30%, I am informed) effective December 1, 2006. That means a big sting to a lot of quality pdf-only and pdf-using publishers, many of whom would likely have to look at price hikes themselves. One of the best things about RPGNow up to this point has been being able to find some absolute gems for as low as a buck or two. DTRPG has traditionally had higher prices, and that's not a trend I'd like to see carry over. Don't get me wrong: I'm not saying this is the end of the world, but it is going to be a major pain to a lot of small publishers. This petition is meant to send a strong message to OneBookShelf that we, fans and publishers alike, find this completely unacceptable. Will they listen? Doubtful, but time will tell, and if you dislike the idea of publishers and gamers getting slapped pretty hard with price hikes, take a moment and put your signature to the petition. Hey, like I said, if nothing else, its a way to vent, right? P.S.--Keep in mind e23 remains independent and will be pursuing no commission hikes. -Vajra Enterprises may not exactly be a household name (yet), but they do one thing better than any other gaming company: release huge "lite" versions of their games. They've kept this up with a 169-page lite version of their Tibet RPG. Called the Monastic Edition , the game is fully playable in this form--and there's even theme music and an instructional video you can download. Tibet definitely doesn't fit in your standard RPG genres, but definitely contains a lot more adventure and intrigue than you might originally think. I was going to sit on this one to increase my chances of winning, but my entries are pretty much lame, so here's a reminder: Iron Crown, inspired by the fakey motivational poster thread at RPGnet, is sponsoring a motivational poster contest of their own. Create the best motivational poster (the I.C.E. crew will be the judges), and win a $50 gift certificate from the I.C.E. online store. Sites like Despair, Inc. make the posters easy to design, so the only part left to you is the whole creative aspect. Better hurry, though--the contest submissions will only be accepted through October 31. The contest has been going on for the better part of the month, and you can see the entries up to this point here. Well, I'm back in the States, friends, and for those of you out there who love Eden Studios' Buffy and Angel RPGs, I have some bad news. It would seem that Eden was unable to come to an agreement with Fox to renew their RPG license for those games. This also means that the Angel/Buffy books currently in production will not see the light of day, either, so no holding your breath waiting on those (with the exception of Eden Studios Presents #3, I'm told). It's a good thing there was an announcement on this front; considering that given Eden's infamous lag times between releases, folks may not have realized the lines were cancelled for another year or so (I kid!). Hey kiddos, I'm in the middle of moving--I fly out of country this Saturday, and will resume my blogging ways soon thereafter as I return to blessed civilian life once more. In the meantime, happy gaming, and, as always if there's something cool out there you've seen (small-market, large-market, indie, traditional, whatever, so long as it rocks), drop me a line and we'll see if we can't help get the word out. Catch you on the flip side (yeah, I still say that). Anyhow, today is a bit of a cop-out post, as the Zachary Moving Experience goes into full-swing. I guess you can add that to my credo. Today I want to do a review not of a single product, but of a product line. Oone Games is a leader (if not the leader) in game maps and map products, and I have nothing but good things to say about their Blueprints series. Each in this line presents a blueprint map of a structure or area. Now, I really enjoy making my own maps, but I also know my limitations. And the fact is, when I look at something like The Great City (free preview here) or Dwarven Stronghold, I see something that will not only impress the heck out of my players, but works to get the wheels in my head moving as well. I also appreciate the fact that there are dozens to pick from--some exotic, some mundane, all really nicely done. Perhaps the best feature of these maps (aside from the near-flawless cartography employed) is the cheap price. I can pick up most maps in this series for under $2, which makes it perfect for rounding out the minimum price at RPGnow. Add a few of these to your wishlist, and I think before too long you'll find you're adding plenty more. I know I haven't recommended many blogs on my site (aside from the ones over in the right-hand column there), but I am going to go ahead and point out I Waste The Buddha With My Crossbow, the new(ish) blog of the good Dr. Rotwang (heckuva name, I know). Not only is he a fellow Hoosier, but he writes fun, clever bits about gaming that for all their hilarity, I find pretty worthwhile. You may have noticed I added a new link to the site: The RPG Site Companion. This site includes an Amazon associate bookstore which is being filled with links to an assortment of well-known as well as indie and small-press games and RPG book available through Amazon. New titles will be added as links are provided, so check back often, and feel free to shoot an email over that way if you have a requested title you'd like to see added. The proceeds from the store will pay (hopefully) for the operating costs of The RPG Site, so you'll also be helping out a forum I've come to truly enjoy. The Companion site also has room to host gaming files, if you have something you've been looking to put online but haven't had a way to get it hosted. Send your requests to mccrow24(at)yahoo.com for more info. (And yes, I know my link jpg isn't exactly overflowing with artistic merit. Hopefully I'll have something a bit better for that at some point). The good folks at Politically Incorrect Games have kept their quality streak alive with the release of Steampunk Musha, a “Victoriental Adventures” setting for Iron Gauntlets. It’s nice to see such an excellent gaming system as IG getting plenty of love and support; despite its relatively small size, PIG is providing as much and more support material for Iron Gauntlets than some companies 3-4 times its size are doing for there lines. Steampunk Musha is a good indicator of the high quality of these releases. My review copy was a pdf, some 122 pages in length. SM (as we will periodically refer to Steampunk Musha) was created by Rick Hershey, with Brett Bernstein and Alana Abbott (an up-and-coming young authoress who you might remember from my Into The Reach review) doing the writing. The artwork throughout is more functional than lush (though nicely done and evocative), but the overall design of the book is one of clarity and ease of reading. Of course, no PIG pdf would be complete without a character sheet, game reference sheet, and map. They keep this up, and I might just (gasp!) expect this behavior from all pdf publishers. In short, Steampunk Musha is more than just a standard fantasy setting, and is definitely not your run-of-the-mill steampunk genre entry, either. I find it interesting that Iron Gauntlets, which has an “Unorthodox” sourcebook series, has produced an unorthodox setting as well. The conflict between technology and the old ways is prevalent throughout, but steers far from becoming cliché or boringly redundant. Despite its unusual premise, the writing of this book is rock-solid, and ensures that Steampunk Musha is another feather in the hat of PIG. If, like me, you often find yourself stuck for inspiration or use a lot of multimedia in your gaming sessions, you may want to check out the Internet Archive, which is a fantastic directory for many of the biggest repositories of free texts, music, pictures, and movies online. A little digging/browsing here can go a long way to help you find the perfect inspriation or piece to use at your table. Connection problems still abound. Hang with me, kiddos. Oh, you can also pick up a few more optional Simple 20 rules with the free Appendices (107 KB, PDF). Holy cow, have I been out of it. A mix of internet outages, service issues, and work has kept me from posting the past few days (ok, so I spent yesterday up in Madrid, where I got to see Picasso's Guernica, Bosch's Garden of Earthly Delights, and Goya's incredible "Black Paintings", but that's besides the point). Anyhow, I'd like to direct your attention towards this series of columns on RPGnet by Shannon Appelcline, detailing the hsitory of some of the more influential gaming companies out there. It's an interesting series to read, and I find myself eagerly awating the next installment. Avast there! No update today, as I be raisin' the black flag off the Spanish Main! Ye mangy curs wot wish to follow, doubloons, grog, wenches, and giving cold steel to fat merchants be the order of the day! Now then, me beauties, hop to belike the divvil himself were givin' chase, and look sharp about it! YARR--see to the cannon--SMARTLY NOW, ye scurvy poxed bilge rats!